The MEDIMS system contributes significantly to the operating efficiency of your practice. Multiple Doctors/Multiple Offices - setup work days and hours for each doctor in each office. 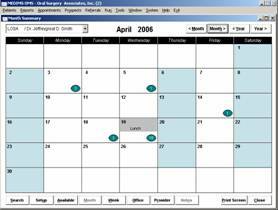 Generate appointment time and date automatically by clicking on a slot. Add, cancel, and reschedule appointments with a click. Maintain history including canceled, rescheduled, and no-show appointments. Enter unlimited notes for each appointment. 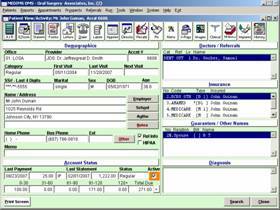 Establish patient registration from appointment. Change day, month, or year with a click. Graphically overview a doctor's schedule, workload, and projected availability. Blockout day or partial day by just clicking on a calendar day. Search appointments by name, account, social security, telephone, or birth date. View daily schedule by clicking on the calendar. Generate daily appointment list for each doctor. Overview patient demographics, account status, referral source, guarantor, and insurance information at a glance. 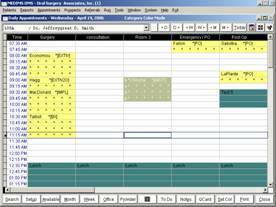 Work with multiple patients simultaneously. 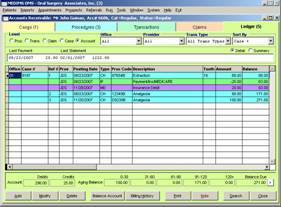 Display patient history including treatment, prescriptions, billing, and appointments. Maintain complete employer and school information for both patient and insured parties. Track referrals in and referrals out. Generate statements, insurance forms, referral letters at time of service. View transactions at the account, case, insurance claim, or procedure level. Generate automatic adjustments when entering procedure charge or payment. Generate insurance claims and referral letters automatically. Bill secondary and tertiary insurance automatically. Add, modify, or delete a transaction with a click. Track outstanding claims at a glance. Less time spent processing the patient means more time spent with the patient. The MEDIMS open system design integrates other technologies. Minimal training is required, which makes cross training easy!